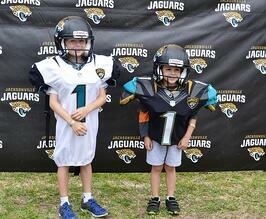 Nocatee Hosts Jacksonville Jaguars at Town Center on April 19th! 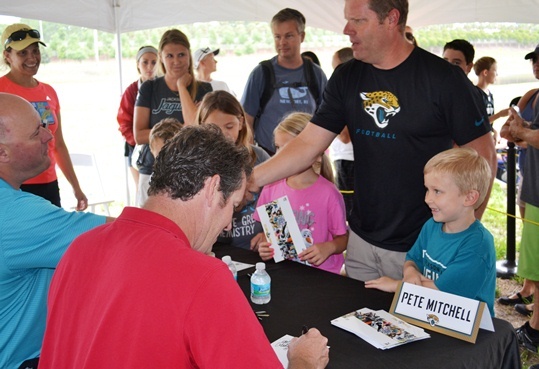 The Jacksonville Jaguars paid a special visit to the Nocatee community on Saturday, April 19th for the 2014 Jaguars Rally and April Nocatee Farmers Market. Over 3,000 Jaguars fans joined the players, ROAR cheerleaders, Jaguars’ D-line, Jaxson de Ville, Tony Boselli and other community guests for this highly-anticipated springtime market. This event was the second annual Jags Rally at the community. The fun pep-rally feel and upbeat Jaguars’ D-Line made for an entertaining and engaging rally for the NFL and Jaguar fans. The day of family-friendly fun also included player autographs, photo opportunities, interactive & inflatable Jaguars games and a centrally-located kid’s craft station. In addition to this month’s special guests, there were over eighty local vendors offering an wide variety of delights that included organic produce, local restaurant favorites, baked goods, hand-crafted jewelry, artwork, herbs/spices, honeys and more. The Market is held the third Saturday of the month between 10:00 a.m. and 2:00 p.m., and is open to the public. 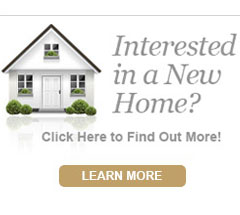 For more on events at Nocatee, download the Nocatee mobile app or visit www.Nocatee.com.